This summer London florist Todich Floral Design prepares to fill homes with bursts of colour, as it unveils its latest line of home decor trends for summer 2015. With summer on our doorstep, Todich Floral Design says, expect an explosion of colour, rich shades, vivid brights and creamy pastels. The flower boutique latest home decor trends, attempts to bring the outdoors in, with a range of dynamic, bold blooms, and takes inspiration from country gardens. Big on flower trends, the corporate florist collection features, an exquisite range of on trend, seasonal blooms in a variety of colours, textures, styles and designs suited to home interiors. With summer on our doorstep, Todich Floral Design, prepares to kick start the new season with spectacular home decor trends for 2015, with corporate flowers that bring a touch of the garden indoors, with an array of flower arrangements to enhance the home interiors. Whether its a preferences for different styles, colours or textures, flowers remain the number one way to add freshness, beauty and warmth to the home, and enables to create a unique space that reflects someone’s personality. Flowers fresh scent and rich colours instantly lift and brighten any home space, from kitchen to family room and bedroom. Flower arrangements work best as focal points. In the summer months when the fireplace isn’t in use, brighten that space with a sunny arrangement of sunny seasonal flowers. Continue this theme by placing the same assortment of seasonal flowers on the mantlepiece. This summer Todich Floral Design predict a surge in vibrant, more daring flower arrangements for the home, as well as softer sumptuous pastel arrangements and a mix of the two. Summer says bye to daises and welcomes seasonal summer flowers such as peonies and hyacinth. The London based florist new home decor trends, prepares to get the summer season started, with fresh seasonal blooms, ushering in the new season with, exquisite sunny arrangements, rich in colour texture and design, certain to brighten the home interiors. Touch of Blue. Usher the garden indoors this summer, with an elegant arrangement of blue hyacinth, white roses and white Gerbera. Strawberry Sundae. If it’s a scrumptious pastel mix, opt for classic white hydrangea, cream roses, candy floss Gerbera and white Alstroemeria. Pink Dreams. For vibrant contrasting arrangements that’s bursting with colour, reach for arrangements of rich pink peony, scented lavender and deep pink roses. Summer Days. A magnificent sunny bouquet arrangement of hot pink Gerbera, vibrant orange roses, bright yellow roses, paired with blue Agapanthus and lashings of forest green foliage. Strawberry Smoothie. For a mix of all pastel favourites, opt for an irresistible summer arrangement of lilac roses, paired with peach roses, candy floss Gerbera and summer foliage. Vases to live by. Experimenting with vases is becoming an increasing trend as more people choose to be creative. Vases can add character and enhance the look of floral arrangements. There’s a move towards vintage vases, jam jars, antique tea cups, watering jugs and other quirky objects which add a unique touch to floral arrangements. Whether its a preference for boho arrangements, vintage blooms, classic soft shades or bold blooms that make a statement, a good vase will ensure arrangements look their best. Traditional. A classic hourglass that’s slim at the neck and full on bottom are perfect for a mixed bouquet arrangements or a bunch of one kind of flower in the same colour shade. The vases classic shape adds a sense of grandeur to flower arrangements. Cube. A square vase made from glass, a great for a variety of mixed bouquets taken from short flowers and luscious green foliage. flower arrangements look best when the base is lined with large Ti=leaves to rid of visible steams. Bud. Made to hold a single stem. Tulips, lilies and orchids work brilliantly with their loot. Others include slim, slender bunch of stems such as baby’s breath which look just as good. Cylinder. A column shaped vase made from clear glass, this type of vase adds a sense of minimalism and a modern, ultra sleek feel to home interiors. Flowers should be arranged to fill the vases, large opening. Provides a modern ultra clean and pars’ when with flowers with strong architectural lines such as lilies, roses, orchids and tulips. Ceramic. Ceramics come in a variety of shapes, whilst its rich colour adds depth and character to floral arrangements. Ceramic work best at hiding flower stems and leaves, use it to hold arrangements that burst with colour. About: Todich Floral Design was founded by Todd Z. 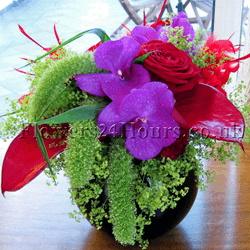 Today and is made up of a team of talented designers and florists with years of experience in the industry. The flower boutique, holds an impressive back catalogue that includes floral designs for corporate clients, luxury hotels and bespoke weddings to private events. Its free consultation provides invaluable advice on designs and flower trends for each event. Todich Floral Designs talented team specialise in harnessing their wealth of knowledge and expertise to turn clients’ floral requests into personalised, exquisite and beautiful designs. London florist Todich Floral Design only uses fresh flowers that meet the company’s strict quality standards and source all flowers and plants from local suppliers or direct from Covent Garden Flower Market. The London based florist maintains a strong focus on seasonality and sustainability and is committed to running an eco-friendly business.In 2011 it was named Best Business for Customer Service at the Lambeth Business Awards and continues to build on this by maintaining top customer service to its corporate an business clients.